I went for a walk with my friend Rachel today. 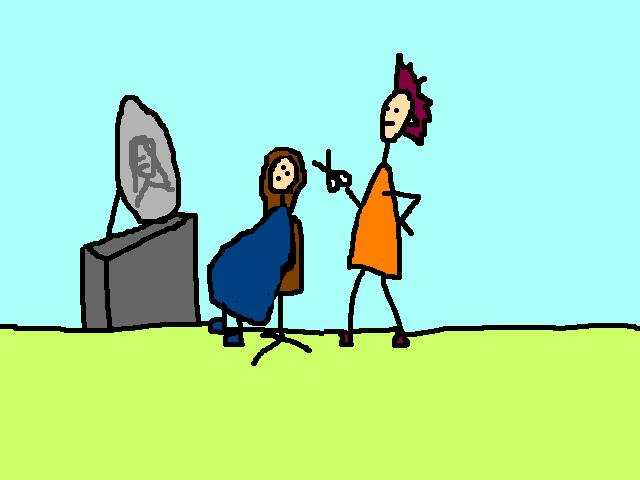 She was going to get her haircut later in the afternoon. "I don't want to go!" she told me. "She'll ask me what products I use! She'll tell me what a terrible state my split ends are in! She'll ask when my last visit was!" The hairdresser had her in a state of terror. And when I thought about it, it was of little surprise. Consider this. 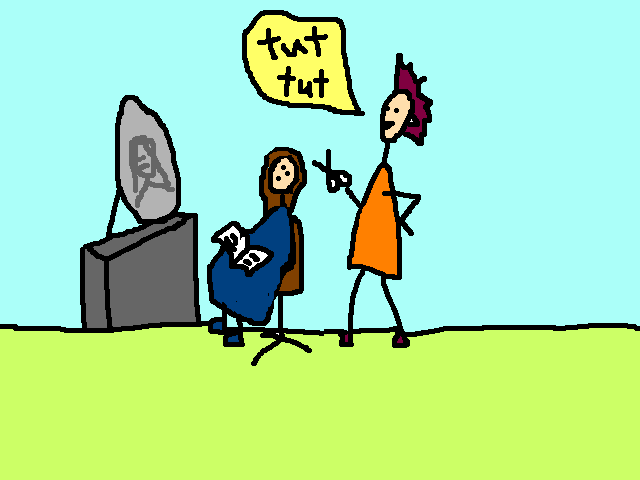 You arrive at the hairdresser. First of all they sit you down and then stand over you with a sharp object. This is blatant intimidation. Then they cover you with a large plastic sheet, thus stripping you, not only of your dignity, but of your basic identity. A classic disempowerment technique. They wet your hair and comb it sharply into a middle parting, thus rendering you in the most unflattering light possible. You are barely human. You have lost all sense of yourself as an individual. Things are bad. But they can get worse. They put you in front of a mirror and force you to stare at yourself for a potentially infinite length of time. You are at their mercy. They have the scissors. You must witness them lording their power over you. Where do you look? Do you look at yourself? They'll think you're vain. Do you look at them? That's weird. Where do you look? Out of desperation, you ask for a magazine. You are plunged into a state of emotional despair by the shallow content of the tabloids. The world is in a state of irreversible decline. Just when things cannot get worse, the hairdresser starts to drill you about your hair regime. 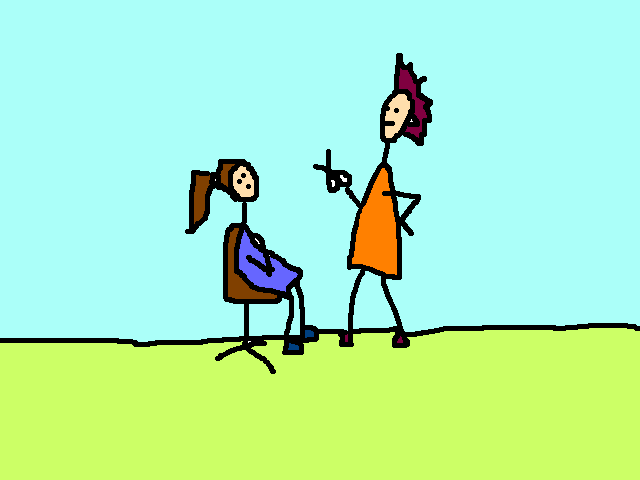 You must apologise for your use of supermarket shampoos and your lack of deep-conditioning. Your fragile state leaves you utterly defenseless against their recommendations to buy extra product that is expensive, but will last you a long long time because you only need to use a tiny bit. You know they are lying. But you must buy things. You have to give them all your money. This is extortion. 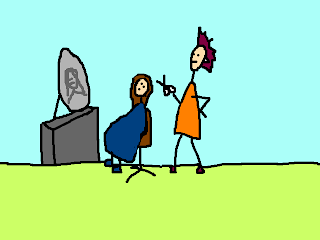 So no, Rachel's phobia of the hairdresser is of little surprise. By making an appointment she was facing the prospect of intimidation, humiliation, moral degradation and theft. Somebody needs to do something! But hey, I bet her hair looks great. So, so true. How's this for a great hair anecdote - my six year old started crying the other day after I brushed her hair. She said to me, with tears streaming down her face, "now it's all puffy like yours mummy". (How's that for a boost to one's self esteem!) I can't believe that the desire for smooth and silky hair has already soaked into her brain (like an insidious deep-treatment conditioner). By the way, loving your blog Anna - Andrew and I think you're funny (in a good way). LOVE this! I have been traumatised by hairdressers before. Thank goodnes I have discovered the most wonderful hairdresser who is the opposite of all you have described here. (Last time I returned home from an appointment with a new do and a litre of unpasturised organic milk. How is that for cool).